If you've ever been to Eastside Pocket on Thayer Street in Providence you know that this Middle Eastern street food is absolutely delicious. In theory the falafel should be healthy. A harmonious mix of chickpeas, parsley, and onion -- seemingly the perfect vegetarian meal for someone such as myself who is watching her calorie intake. If only those deliciouses golf ball sized nuggets of goodness didn't get deep fried before being served up in a wrap, pita pocket, or bed of lettuce. I knew there had to be a better way. In a medium nonstick skillet saute the olive oil, onion, and pepper over medium heat until caramelized. In a food processor puree the onion mixture, parsley, garlic, egg, and chickpeas until smooth. Season with salt and pepper. Return mixture to the nonstick skillet and cook over medium heat stirring frequently until enough moisture evaporates from the mixture to allow it to hold it's shape when formed, about 5 minutes. Using an ice cream scoop or two spoons, scoop golf ball sized mounds onto a parchment paper lined cookie sheet. Bake for 15 minutes. 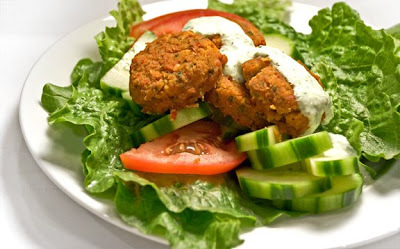 Enjoy with tzatziki sauce, lettuce, tomato, and pita bread. ...and best of all, no one had to die! Combine all ingredients in food processor. Puree until smooth.